If you are building a command-line app and you want to pass multiple values in a single option, there is a built-it support for that in args4j. The only thing you have to do is to extend org.kohsuke.args4j.spi.DelimitedOptionHandler, passing the delimiter ("," in the example below) and the single-value option handler (IntOptionHandler). We refactor this smell by introducing Value Objects. A Value Object represents a domain concept whose identity is made up of all its parts. For example, an instance FullName("Marcin", "Gryszko") of FullName(first, last) cannot be distinguished from another instance FullName("Marcin", "Gryszko"). On the hand, a (DDD) Entity has an identity composed of a single or multiple attributes. Entities are created and its existence continues as time passes. Person(SomePersonalNumberGivenAtBirth("ABC123456"), FullName("Marcin", "Gryszko") refers to the same human being, even if I change my first or last name. Value Objects can wrap single or multiple attributes. Usually, nobody is sniffy about a Value Object with at least two attributes. It’s common sense to encapsulate cohesive attributes into a new type. But what with a single attribute? Why is it worth to invest some time to write additional code? These are my arguments I bring forward to my fellow developers. The same concept is repeated across many domain classes. It’s also quite important in your domain. So you lift it to a type. You give it a well understandable name. Now it’s clear that AccountId means something special in the system. You don’t allow to sneak invalid values into your domain. Everything can be a String. But if you have an EmailAddress, you can roughly verify if the address is syntactically correct1 . Or if the HourOfDay describes a day fraction used on the planet Earth. Is this id a string or a number? Who cares! Let’s hide this information in an Id type. Is long distance in meters or in kilometres? long distanceInKm is much better. However, when we want suddenly make some calculation in inches? Wouldn’t be better that a Distance instance could hide the storage unit and have a couple of creation and conversion method (with distances in various units)? In my current pet project, I have a fake Strava API server. Strava REST API allows you to use JSONP to overcome cross-domain restrictions. You have to add a callback parameter to the query string. When organizing methods inside a class, I use Uncle Bob’s stepdown rule (page 37 of the Clean Code book, Episode 3, Functions of the Clean Coders series). What does the rule say? The code should read like a top-down narrative. Start with high-level, abstract paragraphs. Then dive into details. Translating it into the world of functions: public go first, below you put private functions (used by the public functions), then private functions called from private functions, and so on. Until recently, I was reordering methods manually, until I discovered that IntelliJ can do this work for you (with some limitations, as we are going to see soon). This formatting is not enabled by default. 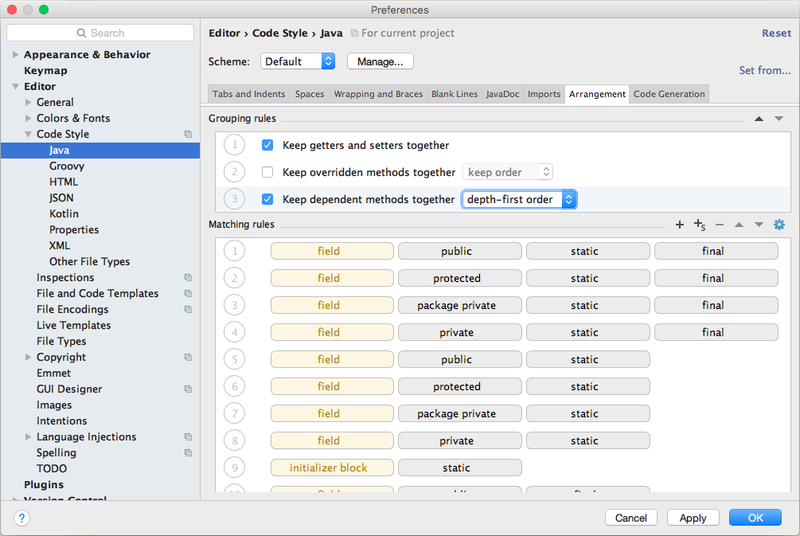 To turn it on, go to Preferences, then Editor/Code Style/Java. In the Arrangement tab, check Keep dependent methods together and select breadth-first order or depth-first order. In both orderings, public method goes first. Fine. Breadth-first puts then both first-level private methods, placing them in the same order as they are called from the public method. Then go second-level private methods. Depth-first algorithm doesn’t take into account the call order. It favors private methods without nesting. Then it puts private methods calling other private methods. I’d expect that depth-first ordering should reorder everything perfectly according to the stepdown rule. However, there is an issue – private methods of the same call level hierarchy remain unordered. Breadth-first takes the call order into account, but the stepdown rule is not 100% followed. Choose the lesser evil. 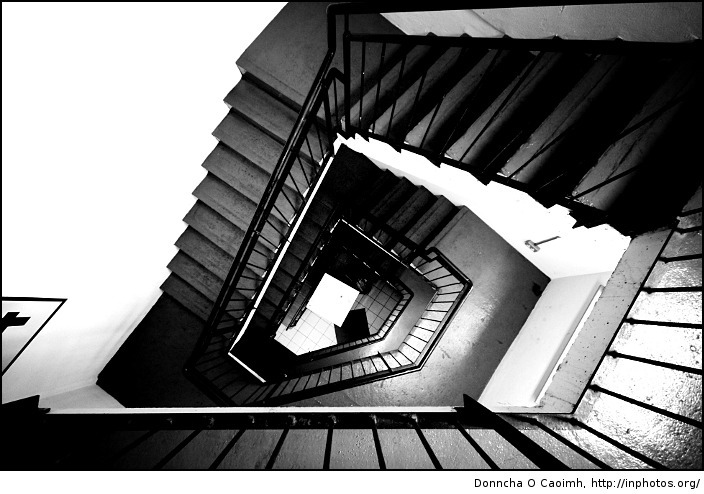 Featured image by Donncha Ó Caoimh. When reading about TDD you find often sentences like “listen to your tests” or “tests give you feedback about design”. How does it look in practice? A couple of days ago I interviewed a prospective frontend developer. He submitted the coding assignment and during the on-site interview we kindly asked him to add a new feature to the solution. The exercise is fairly uncomplicated. You have to display a list of hotels. When a hotel is clicked, its details appear next to the list. The feature to implement was search. Quite simple too – type a text in the box and restrict the list of hotels to the matching ones. I would take us much time to get to a failing test (red lamp in TDD). The test was telling us that we were not on the right way. The component under development probably would have too many responsibilities. I proposed a different solution. There was already implemented an event bus. The idea was to raise an event and let other component worry about how to handle the search. We had a failing test. We got to green very quickly – the implementation of the fill method was straightforward. I wanted to share this story because when I was starting with TDD, the advice “listen to your tests” seemed very awkward. Where do I have to put my ear? Do the tests whisper you that you are wrong? Do they send Morse code? During the programming session I described, it was not a crystal-clear sound. It was a desperate cry for a better design. Credits to Ky for the “Listen” licensed under CC BY 2.0.